Duke University delivery vehicle wrap. Print and Document Services at University of North Carolina Pembroke redid their white delivery cart with this graphic wrap. Thanks for sharing this make-over, Gary Warren. A great way to advertise your services while running about campus! 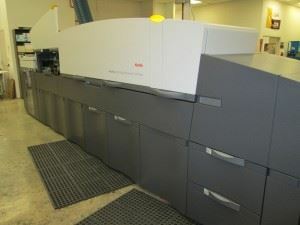 Amherst College installed a new Xerox Versant 80 digital press, producing 80-ppm full color sheets. Rod Squier, manager of Campus Print & Mail Center, says the color accuracy and speed have increased quality and productivity. CSU San Bernardino reports a new installation of an 8-color, 60" Canon image PROGRAF PRO-6000S. Laura Sicklesteel, manager of CSUSB Printing Services says the new unit has a larger images size and faster speed than it previously had.